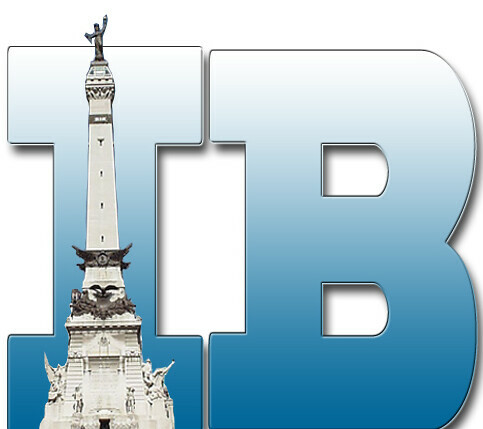 Tonight I was downtown to throng with the theatre folks and promote Indyprov's Welcome to Blanksville. 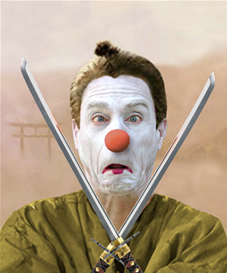 That accomplished, I set out to see my one Must See show for IndyFringe (besides my own :) ) - a show about Samurai, by a mime trained in commedia del arte and improvisation. It was as though they had brought A Show Specifically for Eva to IndyFringe! Seven (x1) Samurai by David Grimes features a cast of 1 and 30+ characters... maybe more, it was hard to keep count. I was riveted by Grime's expressive features and amused mightily by his comedic timing. I loved the way that improvisation and lack of props was such an asset for him; he did some completely insensible things with his imaginary devices, such as sharpening his hand on a whetstone, which would have been stupidly inefficient to stage with props and massively stupid to do in real life. All the set items - doors, a ditch, a horse - were drawn or otherwise indicated. In improvisation these elements shone out like gems on jeweler's velvet. Grimes made a point at times to act in profile, back presented to the audience; although violating a cardinal rule of actors to never turn back on an audience, this worked mightily as doing so presented a different costume effect for some characters. Grimes physical control was such that he could pull it of, even with his neck contorted at a mighty steep angle. I was seated next to a deaf man (or at least severely hearing impaired man); he clearly enjoyed the show mightily, and the dialogue was so sparse that I'm sure he could get the plot and relationship develpment just from the gestures and interactions. I suspect even those with limited English would get 90% of the show. My son, aged 9, saw the plot with me and was in complete awe of Grimes near-adolescent mastery of the art of making bodily noises using his mouth. Note also that I found the content completely appropriate for him to see and I would recommend it for kids; the violence was far less than what might be shown on a Three Stooges reel. The sexual humor was limited to one leering brigand chasing a peasant woman, which I've even seen on a Schoolhouse Rock episode. Of course, I have a rather broad minded approach to kids and art, so your mileage may vary with your own kids. The show concluded, the audience stood to applaud, and my son begged to come back and see it again. What higher praise could I give than that of a child? I'm reading: 7 (x1) Samurai by David GainesTweet this!